After getting up early on Saturday morning, Callie and I found ourselves at the Onion Valley trailhead at 10:30AM with a permit to go up to Matlock Lake for the night. Part of what makes the Southern Sierra so special is how easy it is to access from Los Angeles. A 3 hour drive gets you to some of the best hiking in the world. The parking lot at the trailhead was a ghost town for mid day on a weekend. There were 8 cars scattered throughout the lot. Last year when I parked there on a Saturday afternoon in mid July, there were close to 100 cars in the hikers parking lot. This is a great time to get up to the mountains if you can, they are mostly devoid of the summer crowds that will soon be populating the trails. Additionally, there were no mosquitoes on the trip and the weather was perfectly temperate. The meadows are mostly green, rivers are flowing, and the high peaks still have some large snowfields to further enhance their beauty. This is the best time to be in the Sierra, and we felt lucky to be there. Every day in these beautiful mountains feels like a blessing, and with such great conditions it is hard to not be continually reminded of that. The trail starts at a little over 9,000 feet elevation and gradually ascends about 1300 feet over a couple of miles towards Gilbert Lake. Similar to most Eastern Sierra canyons, there are massive cliffs circling the trail on 3 sides, and looking back there is an expansive view into Owens Valley. To top it off, tiny waterfalls were cascading down the cliffs all around thanks to the early season snowmelt. I rushed through this section last year on my Circle of Solitude trip as I pushed into Kings Canyon, so it was nice to spend some time to savor the trail and take some photos. Callie has been a little cooped up lately. So, she was beaming once we hit the trail, seemingly indifferent to the 10 pounds of gear that she was helping carry up. I reminisced about her first backpacking trip almost exactly one year ago, and marveled at how much she has matured since then. After many miles of hiking together, she has learned my rhythms and stops whenever I pull out my camera, patiently waiting for me to begin walking again before she turns her attention back to the trail. Despite the relatively empty parking lot, we were surprised to see a small parade of hikers heading down the trail. They were all clearly PCT thru-hikers, and we enjoyed getting to meet them and hear about conditions in the backcountry. Callie greeted them all with cheer and a few hikers who were missing their dogs at home stopped and spent some time to enjoy her presence. After a few leisurely hours of hiking, we were at Gilbert Lake. There were already a few people there, so I chose to continue on to Matlock Lake instead of linger at Gilbert or Flower Lake. The trail to Matlock Lake is not marked on most maps, and prior to this trip I had a hard time finding much information on it. To find the trail to Matlock Lake, go to the eastern shore of Flower Lake, and then move to the South and you should see a trail heading up the hill in a South-Southeast direction. The trail is actually very well maintained, despite not being well labeled. It is approximately 3 quarters of a mile long, and it ascends and descends about a hundred feet. The first part of the trail faces North, so there were a few patches of snow along the trail but it was clear the entire way. It appeared as if it had just melted out enough a few days earlier. Callie enjoyed playing in the snow while I enjoyed the view towards Kearsarge Pass with Mount Gould in clear sight. The trail is pretty flat by Sierra standards and after a brief stroll we were at Matlock Lake, which we would have all to ourselves for the rest of the day. The trail reaches the lake at a well used campsite. There are dozens of them throughout the area though, so there’s no need to camp right on the lake shore in plain view. We quickly set up camp in a more secluded area between Matlock Lake and the unnamed lake to its East, and then set off to explore the area. Callie actually preferred to explore the shores of the unnamed lake, as they were much more shallow which allowed her to walk out to various rocks and logs. After walking around the lakes, I busted out my new REI Flexlite Chair on the shore of Matlock Lake and soaked in the scenery. This is a new purchase, bought in anticipation of many of similar trips with my son. For this trip, it was a great addition as it gave me a comfortable way to take the weight off my still injured toe. It packs in at 1.5 pounds, which means it is ludicrous to take on an extended backpacking trip with a lot of miles but easy to throw in the pack for a quick overnight trip. I sat on the lake shore staring at University Peak with nothing but the sounds of birds and running water entering my conscience. It was a profoundly peaceful experience. As the afternoon wore on, the wind picked up and took away any hopes of getting a good reflection of University Peak on the lakes. I worked with the conditions as best as I could, but now I have another reason to come back to this gorgeous lake again. The wind continued throughout the night, and I didn’t even bother trying to photograph sunrise. The light over Matlock Lake seems better at sunset anyways, but regardless, the conditions did not inspire me to hustle around the lake in the early morning. Instead, I relaxed with a cup of coffee and a muffin and enjoyed the scenery some more before packing up camp. By 10AM, we were back at Gilbert Lake, staring at the seemingly endless expanse over Owens Valley. As we round the lake to its Eastern shore, I pulled out my camera again for another shot, and I noticed Callie beside me staring intently across the lake. 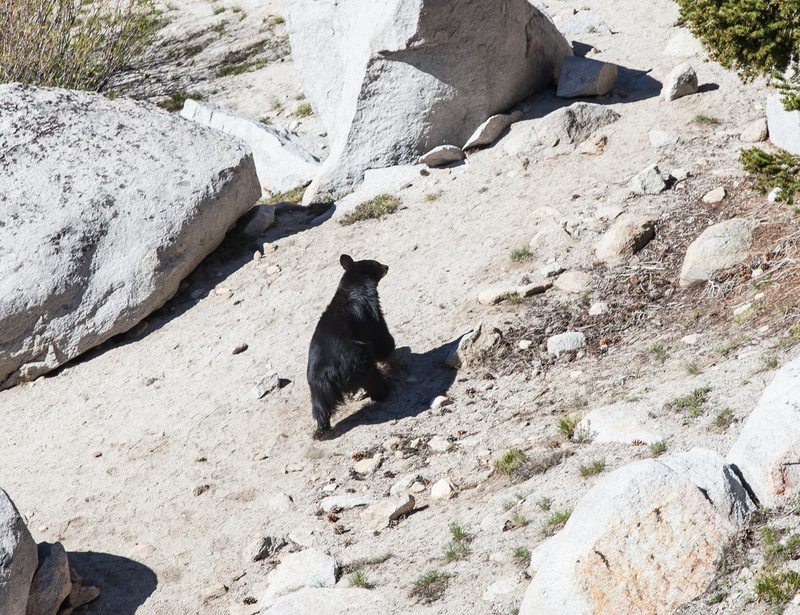 I followed her gaze and noticed a black bear on the lake shore. It was probably less than a hundred feet from me when I took the previous shot, but we hadn’t noticed each other. I quickly leashed Callie up to be extra careful, and we watched the bear for a bit before it scurried up the hill into the woods. The next couple of miles back to the car took less than an hour. The drop into Owens Valley dominates the view the entire time. On the drive home, the Mojave desert was thick with smoke from the Powerhouse Fire which was still raging visibly on the hillside beside Palmdale. It was a remarkable sight, and an ominious sign for what the summer might hold for the Sierra. All the more reason to get out now if you can. Great write up as usual. Tremendous pictures too even without ideal conditions. This sounds like the perfect overnighter for me. I hope to take it sometime. Hopefully I’ll also see a bear. THANKS FOR THIS ENJOYABLE POST! Howdy neighburrito (fellow Altadena resident here.) Fantastic blog you got here. Love the pics and the excellent info on the trails. We are doing a Sierra’s trip over Labor Day with our dog Juniper and our first stop (2 nights) will be Onion Valley. Looks incredible. Questions for ya: at that time of year (probably pretty hot) would this be the best OV hike you suggest? Our dog is bigger and probably not as fit as Callie, so sun exposure is the big concern. I think Kearsarge Pass is a bit too much elevation gain for us so we are leaning towards this one instead. We also need a good one for the second day. I think Matlock would be perfect for you based on your conditions. It will be a bit hot in the middle of the day but the trailhead starts high enough where it won’t be a big issue. Starting in the morning helps a lot. There are a lot of trails near June Lake that I haven’t done yet, so I cannot claim to be an expert. I think the hike to Fern Lake is pretty nice, but haven’t done it. Parker Lake is an amazing spot that would work well. The hike itself isn’t that special but once you get to the lake it is magic. June Lake is also near Devil’s Postpile which is worth checking out, and the nearby Rainbow Falls is pretty as well. Love your blog, keep the posts coming! Itching to get back out there, and hoping to do this trail towards the end of May. When you went, did it get very cold at night? I know it’s early season, but we want to spend a day exploring the surrounding lakes, and maybe up to Kearsarge Pass. Any ideas what snow conditions would be like at higher elevations? I don’t remember it being very cold on that trip. I was at a similar elevation on Memorial Day in 2012, and Callie’s water bowl froze, so it definitely can get pretty cold up there at that time of year. I don’t think you’ll have to contend with much snow around there by the end of May. Maybe a little bit on the trail to Matlock from Flower, since it is on a north facing slope that gets a lot of shade. i was just out at Kearsarge Lakes for three days, and after seeing your beautiful photos and trip report i made a point to not miss Matlock Lake as a little side trip on my way to the pass. i was not disappointed! beautiful setting and such easy access..may have to make another trip back. Thanks for the intel Brett! Wonderful pix and thanks for the write-up! And I love your pooch, what breed is she?….makes me miss my old doggie! I went up to Matlock yesterday and had the lake all to myself as well. Great time of year to be visiting with the cooler weather and no crowds. I cut over to the lake rather than following the trail all the way to its end. 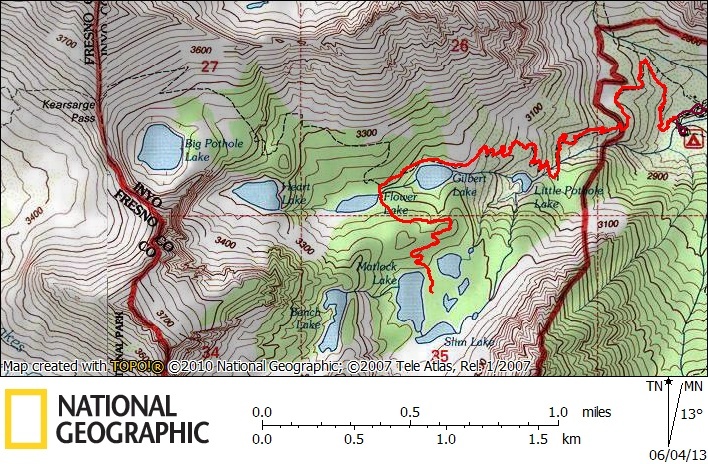 Do you know if the trail continues up to Bench Lake (or is that a cross-country scramble)? Would love to try to make it up there next time. Happy trails! We aren’t really sure what breed Callie is. Regarding your second question, I’ve never gone up to Bench Lake so I can’t comment on whether or not there is a trail. I am lead to believe that there is not one, but I’m not sure. Wow this whole site is right up my alley. Always in the mountains with my Doberman, Tank, and I am a photographer by trade. Keep it up! I’ll be exploring more entries right now. The mileage and elevation gain are at the top of each post. That said, this would be a pretty easy day hike and well worth it. Hopefully all of the smoke from the Rough Fire is gone by then. I was looking into permits for matlock lack and I’m a little confused, is the Kaersarge Pass trail the one I’m looking for? Thanks!